While it’s especially important to monitor blood glucose (BG) or blood sugar levels (BSL) with conditions such as diabetes & pancreatitis and in life circumstances including pregnancy, having a handle on what diet and lifestyle habits will support stable BG can have far reaching effects on our feelings of wellbeing at all times. Of the major nutrients found in food — carbohydrates, protein, and fat — carbs have the biggest effect on our BSL. That’s because carbohydrates are the macronutrient most quickly broken down into glucose for energy. Having too many of the wrong type of carbs can lead to spikes in your blood sugar. In the area of BG control, it is prudent to monitor our consumption of refined carbohydrates such as those found in regular soda, candy, white pasta, white rice, white bread, and other processed foods — they can cause BSL to rise quickly. Fibre in all forms promotes a gradual rise in BSL. Research has shown that people who get enough fibre each day are able to control their BG better than those who don’t – and the type of fibre you eat (soluble or insoluble) may have additional benefits. 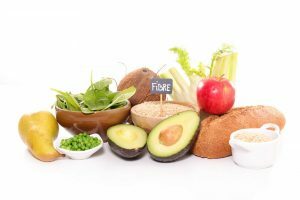 While both are important to support good health, soluble fibre specifically (found largely in oats, apples, and beans) has been shown to have a significant impact on controlling our BSL. Overall, strive to choose fibre-rich, complex carbs such as whole fruits and vegetables (with the skin on when possible), whole grains, and beans & lentils. Because they contain fibre and are minimally (if at all) processed, these foods don’t lead to extreme swings in our BSL. Consuming fibre- rich carbohydrate sources regularly also promotes digestive health and keeps us feeling fuller longer after meals. This is an important piece of the overall health and wellness equation. Grocery shopping can be confusing, especially as many foods may seem healthier than they are at first glance. Regarding BG control, it is important to keep in mind that just because a food is labeled ‘sugar free,’ ‘reduced sugar,’ or ‘no sugar added’ that doesn’t mean it’s carbohydrate reduced or low calorie in any way. Do not rely on advertising claims on the front of the package on this front. 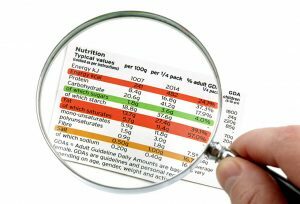 Our best bet is to look at the Nutrition Facts panel and ingredient label on the back of the package. In addition, rather than simply looking at the sugar content of the food in question, we recommend that you check the total amount of carbohydrates in the product. This will paint a complete picture of the amounts of starch, fibre, sugar, and sugar alcohols present – which will impact your BSL. Looking at the complete picture of carbohydrates (as well as protein and fat, as discussed below) will give you a more accurate idea of how the food may actually affect your BG. When carbs are consumed as part of a meal that includes protein and fat, they affect our BSL more slowly. For this reason, planning ahead for healthy, balanced meals is fundamental to good BG management. with amino acids. Research shows that those who consume substantial protein at breakfast had lower blood sugar spikes after both breakfast and lunch than those who did not intentionally include this macronutrient. 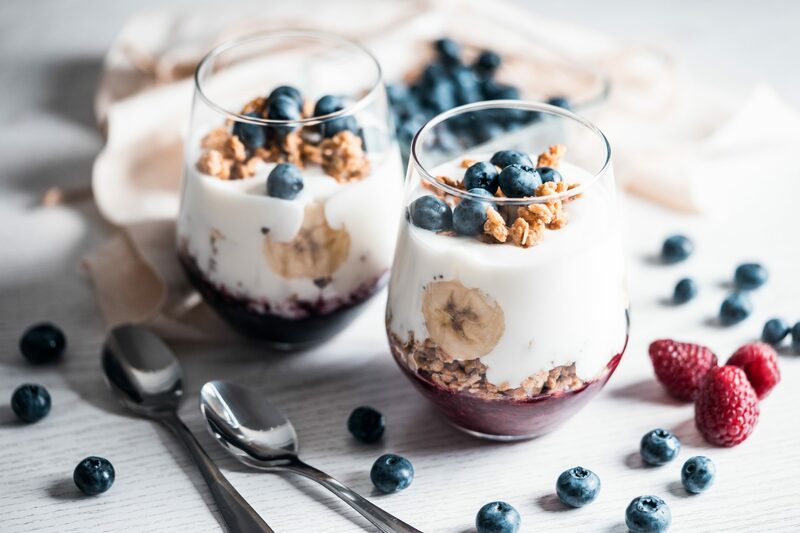 Reduced-fat cottage cheese, plain Greek yogurt, tofu, and egg whites are excellent sources of protein to consider including at this morning meal. But remember that even if we’re mindful with our food choices, eating too much can cause an undesirable effect on BG. In other words, keeping track of what we’re eating — as well as how much we’re eating — and then how it affects BSL and energy levels, is recommended. This point is discussed in more detail below. What we eat makes a difference in your BSL, but so does what we drink. Drinking enough fluid may help you keep our BSL within healthy limits. Additionally, consuming ample fluids throughout the day has the added benefit of helping us feel comfortably satisfied – a feeling which many of us benefit from. While plain water is a good choice to stay hydrated, water infused with fruits and vegetables is notably more interesting. 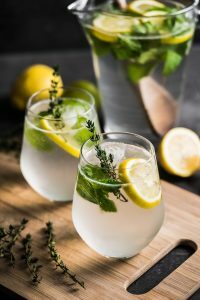 For example, you might try having cut up a lemon or cucumber and in your water, or making ice cubes with fresh fruit or some flavoring in them. Consuming unsweetened tea is also a great choice to meet our hydration needs while monitoring BG. And if you’re not a hot tea drinker, trying cold tea with lemon or a cinnamon stick may appeal to you. In addition to preventing dehydration, consuming adequate fluids each day helps your kidneys flush out the excess BG through urine. Of note, one observational study showed that those who drank more water had better blood sugar control than those who drank less than recommended. Also worth mentioning here, alcohol makes blood sugar drop which can cause cravings for high sugar foods. So if you do drink, we recommend you control how much. We recommend you pace yourself and have a full glass of water after every alcoholic drink. Overall, it is important to keep in mind that water – and other non-caloric beverages – are our best choices to meet our hydration needs while controlling BG. Of note, snacks are a great way to lessen hunger so we don’t end up overeating at meals. But be smart about your choices – focus on snacks that combine carbohydrates, proteins, and fats to help stabilize BG – as discussed above. It has been shown time and time again that portion control helps regulate calorie intake and can lead to weight loss. And controlling our weight promotes healthy BG control – as discussed in the final point below. Routine exercise can help us manage our weight (benefits of which relating to our BSL are discussed below) and increase insulin sensitivity. Increased insulin sensitivity means our cells are better able to use the available sugar in our bloodstream. Exercise also helps our muscles use BG for energy and muscle contraction. This in itself can lead to reduced BSL. Getting enough sleep is important to support our feelings of wellbeing each day and is necessary for good health. Poor sleeping habits and a lack of rest also affect BSL and insulin sensitivity and can increase appetite and promote weight gain. Sleep deprivation can also disrupt important metabolic hormones – specifically, decreasing the release of growth hormones and increasing cortisol levels. Both of these play an important role in BG control. Furthermore, good sleep is about both quantity and quality. As you may have guessed, it is best to get a sufficient amount of high-quality sleep every night. To learn more about this important aspect of our daily life, checkout our blog on sleep habits. Stress can both directly and indirectly affect our BSL. Hormones such as glucagon and cortisol are secreted during stress which cause BSL to go up. Controlling stress levels (through mindful lifestyle practices, self care, or otherwise) will help us control our BSL. To learn more about this important aspect of our daily life, checkout our blog on stress management. Last but most certainly not least, maintaining a healthy weight will improve our health and prevent future health problems. Weight control also promotes healthy BSL and has been shown to reduce the risk of developing chronic conditions such as diabetes. What’s more, these decreased risks can be sustained over the years if a healthy weight is maintained. Consistently following the health habits listed above will contribute to the achievement and maintenance of a healthy weight. In closing, though these tips are very health promoting changes for most, if you have a medical condition or are pregnant we recommend you check with your doctor before making significant lifestyle adjustments. This is particularly important if you have problems with BG control or if you’re taking medications that impact your BSL. In these cases, more advanced methods of BG measuring may be indicated to support your health and feelings of wellbeing.